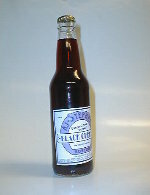 AJ Stephan Black Cherry Pure carb water, cane sugar, natural and artifical flavors, red #40, blue #1, sodium benzoate. SWEET almost too sweet. 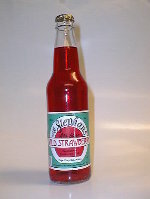 Black cherry flavor competes against the cane sugar. Nothing special here but it is tasty. 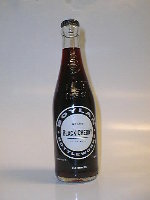 Boylan Black Cherry Excellent flavor, drink this and be very happy! Even though my buds are tainted from the flu bug…..i must say that this flavor is seeping through and providing me with a portion of enjoyment. 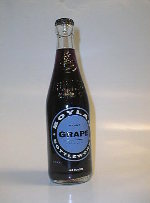 Boylan Grape CARBONATED WATER, CANE SUGAR, NATURAL & ARTIFICIAL FLAVORS, CITIRC ACID, RED 40, BLUE 1, SODIUM BENZOATE (A PRESERVATIVE),. Grapeity good! Most eeexcellent, Smithers, pour me another mug of soda. High points for capturing that childhood grape kool aid taste. Ahhh, this reminds me of when I would pick grapes right off the vine and eat them. The fizzle is crisp and the aftertaste is that of authentic grapeliness. 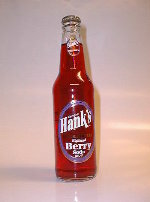 Hanks Berry Soda CARBONATED WATER, HIGH FRUCTOSE CORN SYRUP, NATURAL AND ARTIFICIAL FLAVOR, CITRIC ACID, SODIUM BENZOATE(PRESERVATIVE), RED #40, AND BLUE #1 A very smooth balance between carbonation and berry flavor. The berry flavor is not identifiable. Which berry is it? Only Hank knows. Although I found it a bit on the candy-ish side, it is not overbearing. Great for fruity gut busters! A five on the belch-o-rama. Berry? What kind of berry? No matter. Hanks is always good stuff. Taste better if served pretty cold. 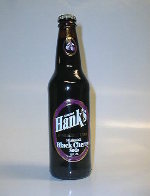 Hanks Black Cherry Soda FILTERED CARBONATED WATER, HIGH FRUCTOSE CORN SYRUP, NATURAL AND ARTIFICIAL FLAVOR, CITRIC ACID, SODIUM BENZOATE(PRESERVATIVE), CARAMEL COLOR, RED #40, AND BLUE #1 Another smooth soda from Philly brewing company. The flavor is good. It is NOT your bulk store Black Cherry soda. This one has an easy affect on the taste buds. 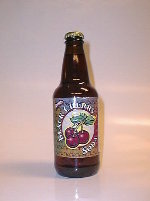 If you could get a fresh picked black cherry taste in a bottle, it would have Hank’s written on the outside. Almost intoxicating. I think that this is thick enough to pour on my pancakes. Get yourself a plate full of this stuff and drink it. 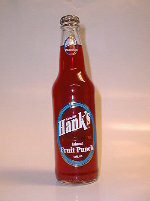 Hanks Fruit Punch Can you say sweet? This has some fruit tang to it also. It is a different fruit punch taste that reminds me of the Rum Jungle, catamaran ride I was on… maybe it needs rum? Holy zip bang batman. This made my face pucker. An extreme contrast from hanks orange. I wonder what fruit was making all that zip…it sure the hey wasn’t the orange. Hanks Orange Cream Soda CARBONATED WATER, HIGH FRUCTOSE CORN SYRUP, ORANGE JUICE CONCENTRATE, NATURAL AND ARTIFICIAL FLAVOR, CITRIC ACID, SODIUM BENZOATE(PRESERVATIVE), FOOD STARCH MODIFIED, GLYCEROL ESTER OF WOOD ROSIN, YELLOW #6, RED #40, BROMINATED SOYBEAN OIL AND BHA (TO PROTECT FLAVOR) No Pic Have I mentioned how smooth this stuff is? Very tasty indeed. Even the small disc of ice that floated up from the bottom of my frosty mug was pure popsicle enjoyment. Not as good as many of the other Hank products that I have consumed. When I think of orange cream, I think of those ice cream bars that are so awesome. This was close but not quite on. 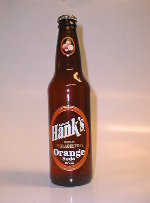 Hanks Orange Soda CARBONATED WATER, HIGH FRUCTOSE CORN SYRUP, NATURAL FLAVOR, CITRIC ACID, ORANGE JUICE CONCENTRATE, SODIUM BENZOATE(PRESERVATIVE), ACACIA, ESTER OF WOOD ROSIN, YELLOW #6, RED #40, BROMINATED SOYBEAN OIL AND BHA (TO PROTECT FLAVOR) First sip makes the jaw muscles ache as the great orange flavors whisks across your tongue. A six pack of this is not going to last long! Good stuff Maynard! A little short on the fizz factor. The word orange drink comes to mind. I believe an orange soda would have a little more umph to it.